In the book Get Active: Reimagining Learning Spaces for Student Success, the authors identify six types of active learning spaces that are essential for creating an engaging learning environment for students. 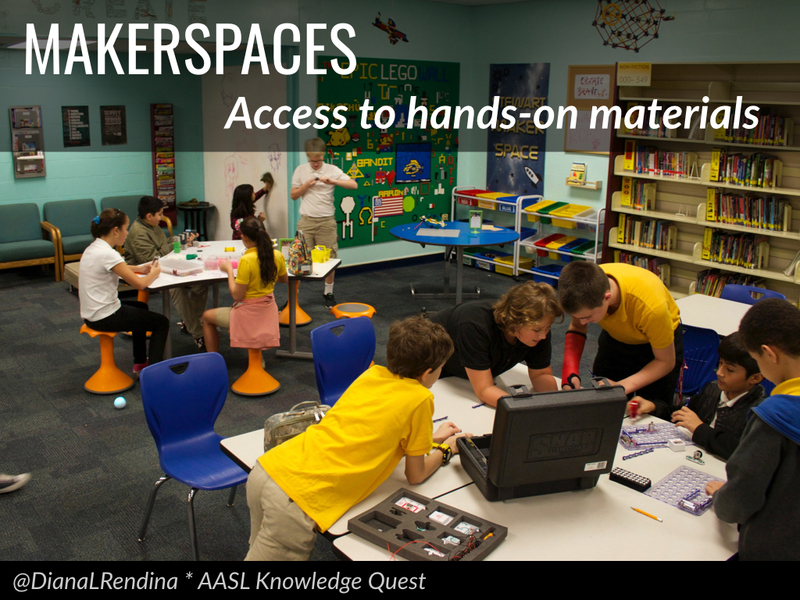 While this research (and this book) are not specifically focused on school libraries, we are the ideal place in our schools to encompass all six types of learning spaces in one location. We are the learning hubs of our schools after all. :) You might find that many of these spaces will overlap in your library, or that their purpose might shift depending on the day. That’s totally normal considering how flexible our spaces have to be. Aim for having all six areas available as much as possible. 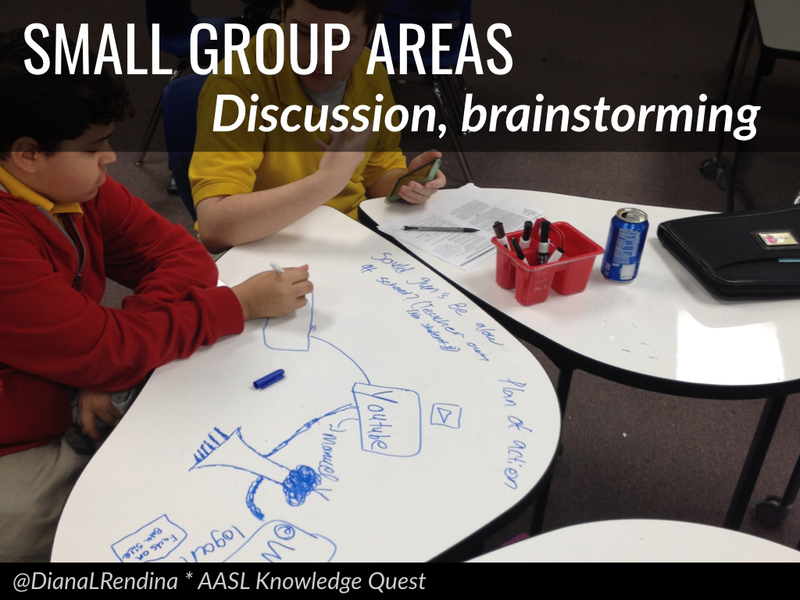 In your library, make sure that you have areas available where small groups of students can meet, talk and brainstorm. For some schools, this might be a row of diner booths on one wall. For another it might be whiteboard tables set up for small group brainstorming sessions. Other schools might have teaming tables with a monitor where students can share their device screens. It’s all about what works best for your space and your students. If possible, try to make it possible for small groups to have a bit of privacy, so that they don’t feel like their conversations are being overheard by the entire library. 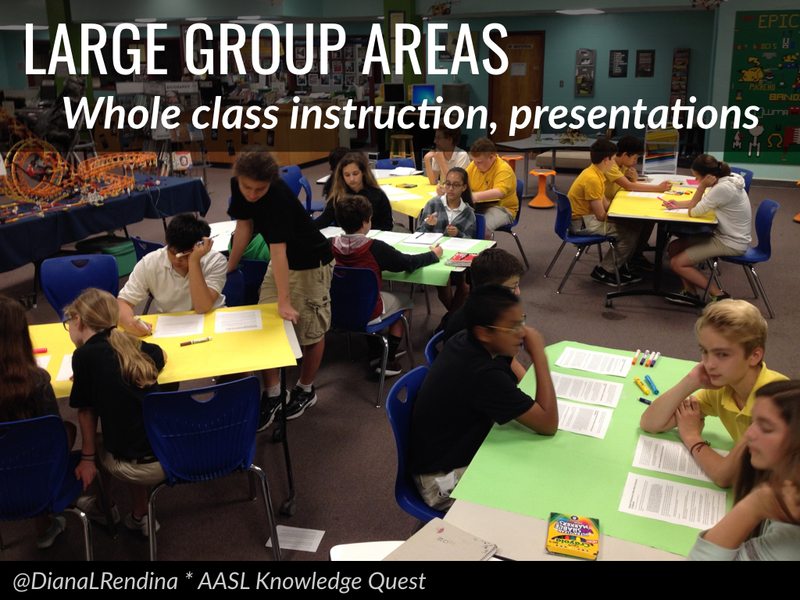 By default, most school libraries already have a large group area. This will usually be the learning space where you hold classes. Advocate for flexible furnishings in this area if you are still stuck with the heavy traditional library tables. Having furniture that can be reconfigured in your large group area will make it easier to transition the space for different styles of teaching and learning. Make sure that you have an easy-to-use presentation setup too–ideally this space should always have a projector, laptop and screen setup and ready to go. If you have the space, have multiple large group areas so that you can accommodate multiple classes and learning styles. Often, the community area will be one and the same with the large group area. Some libraries might be lucky enough to have an audiotorium or multipurpose room attached. 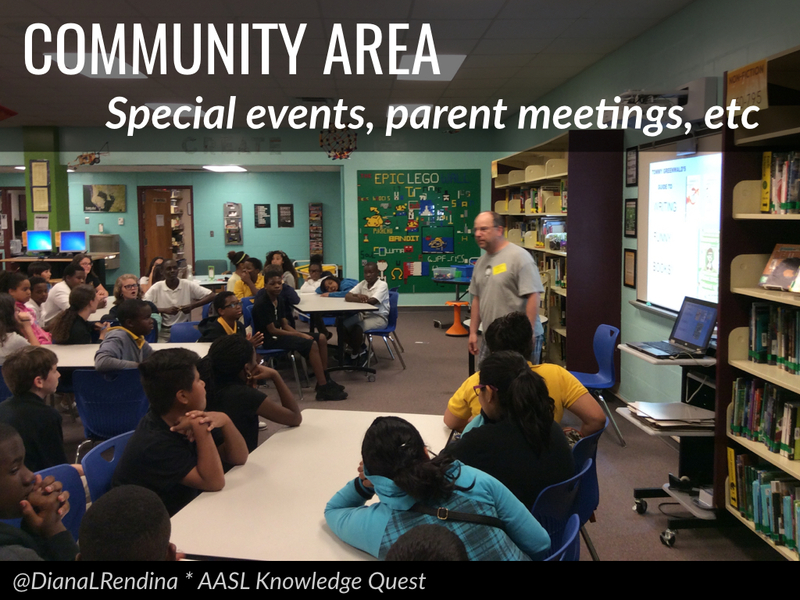 If you don’t, more than likely your large group area will also be where you host special events like author visits, bookfairs, parent meetings, etc. This is why flexible furniture is crucial for making your learning space truly active. Your library should have a space where students can utilize technology. Many of us have computer labs or computer stations in our libraries already, but try to think beyond just the basic computer lab. Could you include tablets that students can check out to use? Could you purchase a high-powered computer setup for photoediting? Could you create a small music studio in an old storage room where students could record podcasts, music and spoken word poetry? With more and more of our students already equipped with their own devices, we need to rethink how we can provide technology experiences that they don’t already have access to. Once upon a time, all of our libraries were pristinely quiet, intended solely for students to come in and read a book quietly. However, that paradigm has shifted, and many of our libraries are quite loud now. We still need to find a way to serve those students who just want to find a place to lose themselves in a book. 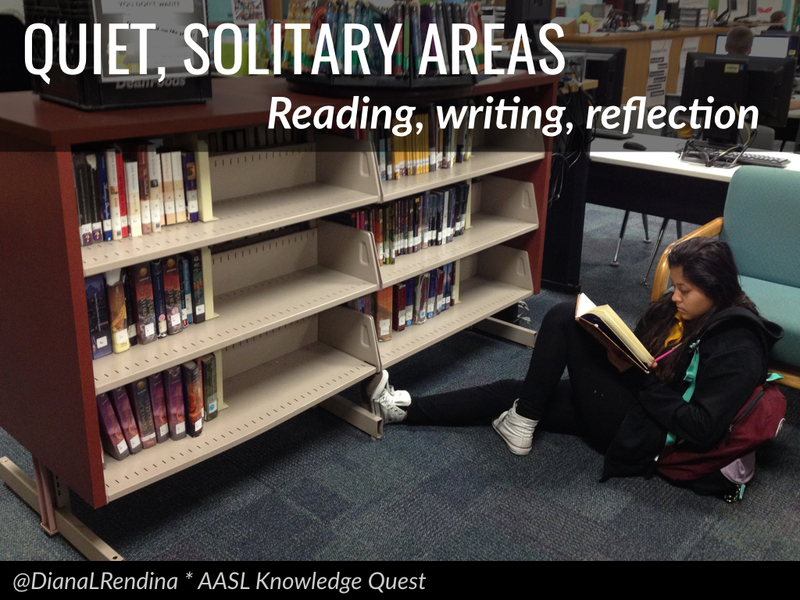 If you have the space, try to designate a quiet room or quiet zone in your library, where students will know to keep the volume down. Look into creating “cave” spaces by rearranging furniture or providing screens or dividers to help students feel a little more solitary. My library has a very open layout, so we decided to rearrange our floor shelving units to create mini-caves in our fiction section. It’s not perfectly quiet, but it does provide a good solitary space for our students who need it. Makerspaces come in all shapes and sizes, from a bin of LEGOs on a table in the corner to a full-blown fab lab with 3D printers and laser cutters. How exactly it comes together in your space depends on you and your students and what works best. Try to find a way to give students access to hands-on materials where they can explore new ideas and have creative play experiences. This might be a LEGO wall, a whiteboard wall, an arts & crafts supply cart. Whatever it is, make sure you have a place for creativity in your library. 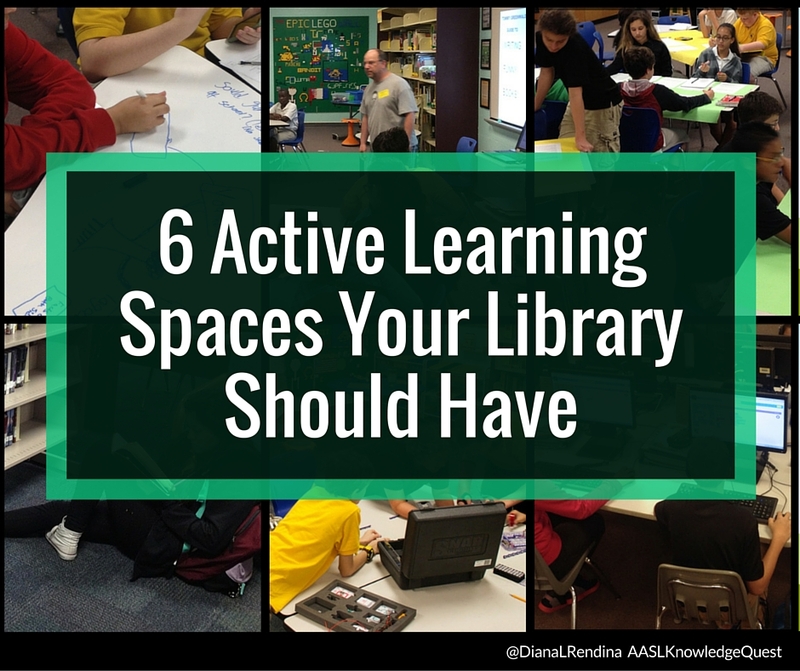 How do the six active learning spaces manifest themselves in your library? Is there a space that’s missing that you need to work on? Great article, Diana! Though I gotta admit use of the word SHOULD always get’s my oppositional defiant hackles rising. Because I don’t want to GUILT people into innovation. Maybe I woulda used the word COULD or 6 Active Learning Spaces Cool for Your Library. But then again, I’m weird that way! ALWAYS love your ideas & advocacy Diana! You’re my Makerspace guru! Lets as a country commit to re-imagining our public libraries based on what is relavant to today’s AND tomorrow’s library users of all ages, interests and abilities. I am working in the quiet area since is a new media center and it full of activity at lunch time with not a single space walled, just a open space place. I am in the process to use my storage space for that. I don’t have lot of things in the storage. I haven’t do it since it doesn’t have ventilation, just the door. I am trying to get a screen door so the air conditioning runs through it. Wish me luck with the burocratic processes. Love the Lego wall. How did you get the baseplates to stay up there? Command strips? Wanting to do this, but want all the pieces in place before I start :) Thank you for your input. I recognized that the space and photos you used were of a library with movable furnishings and a bit larger than many of us have in our library. I do have quiet spaces, a classroom area, which also can be used for smaller or large groups, depending on how you place furnishings, but I only have two computers available. One for admin and the other for circulation. Technology rich isn’t possible without technology. I used to use my SmartBoard all the time. But alas, there are no more free downloads of the software. Over $200 just to download now. I can’t afford this at all. We are trying, but we don’t all have the same abilities or availability.